This week’s Yoga Moment comes from Christina Romano during her practice at Satya Yoga Shala in Farmingdale, New York. 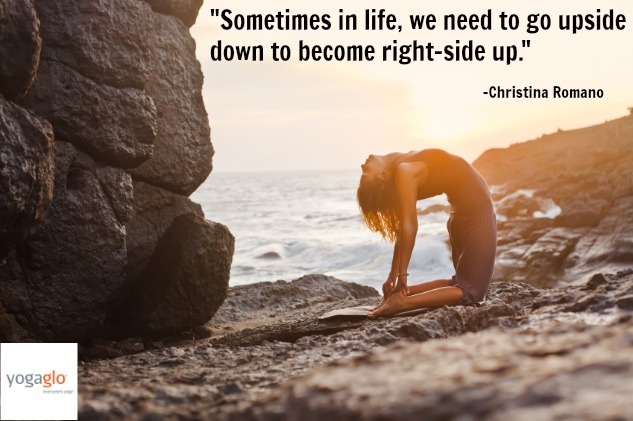 “My practice of yoga began four years ago when I found myself broken to pieces over another “failed” relationship and at sorts with my distressing emotional and physical state. Deep down I knew that if I wanted different results in my life that serious change was inevitable. First, was accepting that I would never have a healthy trusting relationship with anyone if I didn’t have it with myself. This led me to taking time for myself, trying new hobbies and eventually to the mat. In the beginning it was the simplest poses that continuously made me aware of the pure fact that you are in full control of every aspect of your body and mind. At some point in my life I gave up this control and made myself the victim; possibly because it’s easier to place blame of your failures on someone else. When you own the responsibility of your actions, you are the only one who can be held accountable; an empowering notion to live by. Through my beginners practice I also learned that if you want your body to move and twist in a certain way, you simply ask it to do so – chances are you’ll be surprised at what you are truly capable of, things that you probably never imagined were possible.